Until 25 years ago, the only known planets belonged to our Solar System, being Jupiter the most massive (with nearly 320 Earth masses). Back then, there was a gap in mass between the most massive planet known and the least massive stars, with masses starting at approximately 100 masses of Jupiter. First predicted by theoretical models of star/planet formation, the objects that fill in the gap between giant planets and low-mass stars are called brown dwarfs. Unlike fully-fledged stars, brown dwarfs do not reach enough mass to start hydrogen fusion in their cores. As a consequence, since they are formed, these objects cool down and dim with time; but even the hottest/nearest ones remain hardly detectable in the visible light. We had to wait the mid-1990s for the first brown dwarfs to be detected from Spain (Teide 1 then Calar 3). Since then, more than two thousand brown dwarfs have been found, having temperatures from 2600ºC down to Earth-like ones, even below 0ºC! The advantage of studying brown dwarfs is that they are found usually in isolation, not as a companion of a star, like most giant exoplanets. Brown dwarfs, not being commonly hidden in the bright halo of a host star, are therefore technically easier to observe, in particular at (near-)infrared wavelengths. Most brown dwarfs have indeed been detected by infrared surveys like 2MASS or WISE, also thanks to their usual large proper motions: the slight change in their apparent positions on the sky over the years helps to identify them in such surveys. The fully-convective atmospheres of the least massive brown dwarfs are probably similar to those of giant (exo)planets planets like Jupiter. They are also expected to have spots and bands, and they are formed by dust particles of different compositions, implying a very “hazy” (and even stormy, may be) atmosphere. Analyzing the properties of the upcoming light from brown dwarfs, we can constrain the properties of their atmospheres. Light is an electromagnetic wave that oscillates randomly, but perpendicularly to its direction of propagation. Under specific conditions, like in the case in which the light encounters dust particles, the oscillation of the light is constrained only to one plane. In this case, we say that light is polarized. Detecting polarized light from brown dwarfs provides information about the particles present in them, and it is therefore a useful tool to study their atmospheres. A study, lead by Elena Manjavacas, from the Instituto de Astrofísica de Canarias and University of Arizona, analyzed the polarimetric properties of the (red) light from a sample of six brown dwarfs, using the CAFOS instrument on the 2.2m telescope at Calar Alto Observatory. “We detected linear polarization from the upcoming light of one of our targets: 2MASS J04221413+1530525, a brown dwarf with a surface temperature of approximately 2500ºC in the constellation of Taurus” Elena Manjavacas says. This object lies 10º south of the Taurus-Auriga star-forming complex, in which new stars are forming from the gas and dust existing in the region. “The most intriguing part of our result is that we do not know with total certainty the cause of the polarized light observed, mainly due to the fact that the distance to the object is not well-known” emphasizes Elena Manjavacas. Several authors have provided two different values of its distance: 782 light-years or 131 light-years. 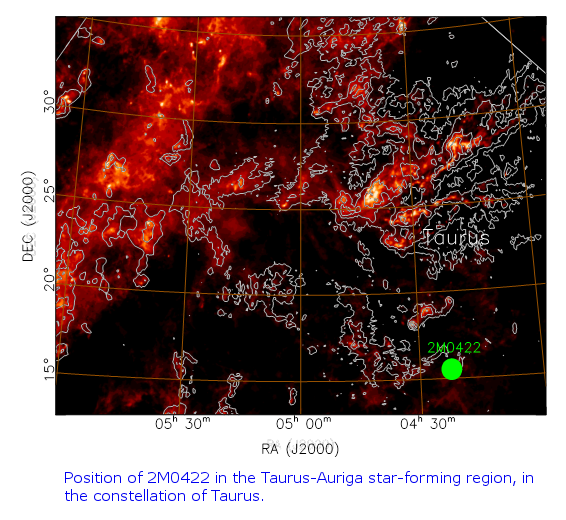 If the first value of the distance is correct, then 2MASS J04221413+1530525 would be behind or embedded in the gas and dust of the Taurus-Auriga star-forming region. Then, dust in that region might be the most feasible explanation for the polarized light we detected from 2MASS J04221413+1530525. In case the correct distance is 131 light-years, there are different scenarios that could explain the fact that the light from the object is linearly polarized: dust in the atmosphere of 2MASS J04221413+1530525 (like a haze of submicron-sized particles), a protoplanetary or debris disk, or even a potential transiting planet. To determine the actual cause of the linearly polarized light of 2MASS J04221413+1530525, a better determination of the actual distance to the object is needed. This research is a collaboration between the Instituto de Astrofísica de Canarias (Tenerife, Spain), the University of Arizona (Tucson, USA), the University of Western Ontario (London, Canada), the Centro de Astrobiología (CSIC-INTA, Madrid, Spain), the Max-Planck-Institut für Astronomie (Heidelberg, Germany), and the ETH Institute for Astronomy (Zürich, Switzerland).